In response to some confusion that exists about renewal options for interment rights and perpetuity and some letters to the Editor, The Advertiser, here is a letter that was sent form our CEO, Janet Miller. Only some of the letter was published in The Advertiser, on 4 February but to see the full letter please see below. and Dorothy Fletcher 29 January. In response to the letters regarding renewals of memorial positions for burials and ashes in cemeteries in South Australia, I wish to provide some clarification as we are aware that there is great deal of confusion in the community. It is hard to condense this information further without adding to that confusion, given the number of points of concern raised by your readers and the need to reassure and provide them with the correct information. It may be that this information is best placed as an opinion editorial piece, rather than in the Letters to the Editor section of The Advertiser. Given the level of interest from your readers, it may be advantageous to them if we were to provide you with a series of pieces for publication to help educate and inform your readers. We have plenty of useful information to share and welcome a discussion with you if you believe it could add value to your readers. We understand that memorials to loved ones are extremely important and interestingly, according to research we’ve conducted, the importance of memorialisation in a cemetery is highest among the younger members of our community. People appreciate being able to visit, remember and reflect on loved ones they have lost, or their ancestors. Centennial Park, South Australia’s leading provider of cemetery, cremation, funeral and garden memorial services offers a stunning botanical park covering 40 hectares, with many options for memorialisation. We host more than 1,400 funeral services a year, over 700 burials, more than 3,500 cremations and establish more than 1,500 new ashes memorials every year. We know that making decisions around memorialisation and renewing can be extremely sensitive and families are always welcome to contact us with any questions they may have. Until 2013, South Australian legislation only allowed for interment rights – the right to bury or to inter ashes into a position in a cemetery, and to erect a monument – for a limited period. The change in legislation gave cemeteries the choice to offer these rights in perpetuity and so Centennial Park started offering families the choice in August 2015. We are the only major metropolitan cemetery in South Australia to offer perpetuity. All interment rights purchased prior to 2013 have an expiry date. Since 2013, unless a perpetual interment right was purchased, interment rights continue to have expiry dates. The choice about how long to renew an interment right for lies with the family, providing the renewal is for a period of at least five years. The minimum five years is a requirement of the legislation (Burial and Cremation Act 2013 (SA)). 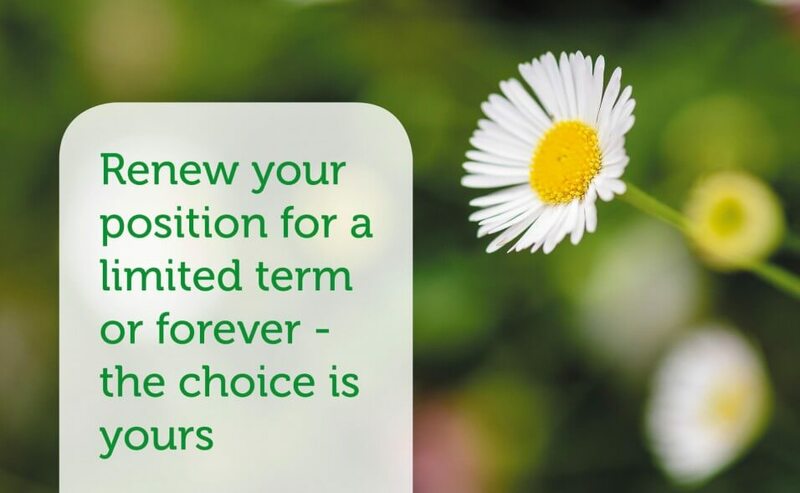 Perpetuity is just one option we are able to provide our families, and is for those families who wish to ensure a position remains theirs, forever, without having to worry about who in the family will bear the cost of renewing the interment right in the future. The price to purchase a perpetual interment right or to extend a current interment right in perpetuity is based on an actuarial calculation that takes into account the costs to maintain the position at Centennial Park forever. The actuarial calculation is reviewed from time to time and the price is subject to change. Amounts paid for renewals in the past are also factored into the perpetuity calculation. Some families decide to use some estate funds for renewing in perpetuity. Renewal fees for interment rights on burial positions at Centennial Park currently start at $84 per year ($420 for the minimum five year period) up to the most expensive at $398 per year ($1,990 for the minimum five year period) . Generally, burial positions can accommodate three burials, so families can choose to have up to three family members buried in separate positions or together in the one position. Burial positions at Centennial Park are also able to accommodate 16 sets of ashes for those families who wish for many family members to be laid to rest together. In the ashes memorial areas, interment rights can be renewed from $34 per year ($170 for the minimum five year period) up to the most expensive at $564 per year ($2,820 for the minimum five year renewal period). Prices are less in our special areas dedicated to children who were sadly with their families for such a short time. The revenue we receive, including that for interment right renewals, is used to beautify and maintain the positions and the Park in general. Some areas cost us more to look after than others, hence the different prices and the choices families have. For example, not all areas are irrigated and families can choose an area that is irrigated or one that relies on rainfall and prices vary accordingly. Some areas have significant landscaping and plantings elements. We are a self-funded organisation owned by Mitcham and Unley Councils. We pay fees to the owner councils in recognition of the guarantee they provide to Centennial Park. We pride ourselves on giving back to the community and are committed to maintaining the Park to its current standard or better, for the community, forever. We work hard to keep our costs down and also to be environmentally sustainable. We use a lot of solar power and bore water and work hard to reduce our carbon emissions and the amount of waste we send to landfill. If an interment right expires and the family does not wish to extend it, the family can choose to surrender the right and the position can be made available for others to use. Headstones and plaques are the property of families – they do not belong to the cemetery – and families can choose to take them with them if they want them maintained. When another family buys the right to use the position, it is prepared with the utmost dignity, care and respect for all concerned. We acknowledge this an extremely sensitive issue and one that is governed by legislation. In the case of a burial position, we deepen the grave (graves can generally accommodate three burials) and place the existing human remains in an ossuary box and bury it deeper in the grave. The existing remains are not removed but are very respectfully cared for. New owners of the position can then use the grave for up to three burials and place a new headstone. For ashes positions, families can elect to have the ashes returned to them or they may choose to have them remain at Centennial Park in an unmarked location. We do not remove ashes or human remains from the Park and we treat them with the utmost respect. When interment rights expire, we make every effort to contact the holder of the interment right, as required under the Burial and Cremation Act 2013 (SA). We write letters to the interment right holders from at least one year in advance of the expiry date. We also place public notices in The Advertiser and place a sticker on the headstone or plaque positions encouraging families to contact us. We continually remind families and the general public to update their contact details with us so that we can make contact if the need arises. Under the Act, if we have not been contacted by the family after two years of the expiry date, ownership of the position reverts to Centennial Park and it may be re-used. Centennial Park, like all cemeteries, is required to comply with the Burial and Cremation Act 2013 (SA) and all relevant Regulations. Interment rights on burial and ashes positions are issued under the Act and oblige the cemetery to leave remains undisturbed in the position for so long as the interment right remains in force and also to leave any headstone or plaque undisturbed, as long it is kept in good repair. The headstones and plaques are not ours to maintain, but the property of families. The only time the cemetery is able to disturb the deceased is at the request of the interment right holder to make room for further burials in a position or in exceptional circumstances, with an application by them to the Attorney General. The Attorney General weighs up a number of factors before granting any approvals to disturb burial remains. We encourage families to contact us with any questions they may have about positions at Centennial Park, whether they be for burials or ashes – or even plaque-only positions where a family wishes to have a memorial in a public space but have the ashes at home, such as in an urn. We also offer urns and jewellery options for families and friends to memorialise loved ones – both of which can have some or all ashes of a deceased placed in them. Centennial Park understands that decisions around memorialisation are difficult and sometimes many family members need to be consulted. That’s why we’ve established a place in our Park for ashes to be held for several months while families are considering their options. Contemplation Court is a beautiful reflective space where family and friends can visit a loved one they’ve lost, while a more permanent memorial place is chosen. There is no cost to the family to have ashes in this transitional space and we were the first cemetery to offer a space like this in Australia. We will also be the first cemetery in South Australia to have a café and catering facility on site, following approval by our owner councils. We hope to commence construction of this contemporary facility for our families and others who visit Centennial Park later this year and open it in 2020. We want Centennial Park to be place where the community feels welcome and supported. We offer an Embracing Life program of activities which include yoga, meditation, tours and more as we encourage people to visit and make the most of the stunning botanical gardens, nature and art on offer every day. We also offer a free My Story Book for people to record the special things about themselves and their wishes and their lives which can be a very useful tool for planning and informing others.